Blogger's navigation tool that rests atop the template of your Blogger is a useful tool to discover blogs or to sign into your Blogger account when you're visiting your blog. Unfortunately it is a useful tool but one that is a distraction to the overall look of your blog especially if you've taken the time to redesign your template and customize your blog. A lot of people who use Blogger just pull out the piece of code that displays Blogger's navigation bar but I like the purpose that it provides and worry about removing any future functions Blogger may possibly incorporate into the navigation bar. Scroll down a little bit from the top of your template to find the line of code. Here are two scrceenshots to help you with the placing of the code. 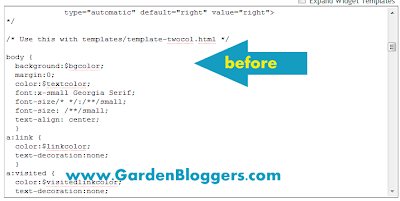 Once you've pasted the code into your template click "Preview" and if you did it right you should get a successful preview of your blog without the Blogger navigation bar displaying. After that you can click save and continue with your blog. hi again! thanks so much for stopping by my blog and sharing this cool tip of info. just applied it and the blogger bar has successfully vanished. thanks again for all the great info! No prob. Glad you found it helpful. It's sort of working for me. I am using one of the new templates, not sure if that may be what's causing the strange behavior, but the hover doesn't work. The bar is still there, but invisible. Any suggestions? Checked out your blog and it works he way it's suppose to work. You're not suppose to see the bar unless you hover your mouse over it. Instead of stripping the code out this method allows you to mask the bar to give you a cleaner, custom look without having to remove something that Blogger may ask you to put back down the line. The blogroll hasn't been updated in a while because I've gotten busy with some projects. Once I clean up that template I'll open it again. Ah, yes, now I can see that it is working. I was on IE on my work computer where a lot of things on blogger do not work right. I just found your site yesterday, there's a lot of helpful information on it. Thanks for all the tips. Thank you very much,Code works!